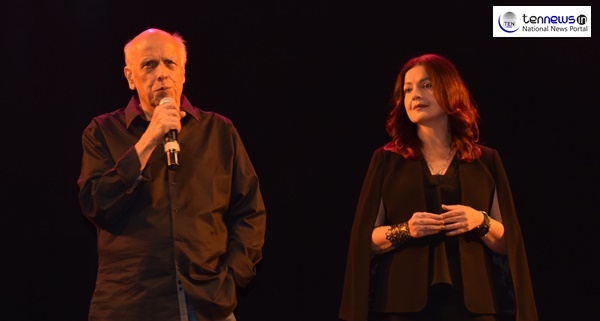 New Delhi: Ace filmmaker Mahesh Bhatt and his daughter Pooja Bhatt were in Delhi for screening of their play Daddy, which was inspired from Mahesh Bhatt’s super hit film ‘Daddy’. Daddy was the debut film of Pooja Bhatt and was written by his father Mahesh Bhatt. It is a story of an alcoholic father, who is successful man and a habitual drinker but his daughter who hates alcohol persuade him to leave alcohol. Before the screening of the drama, which happened in Sri Ram Centre, New Delhi duo shared their journey of leaving alcoholism. “I was a successful filmmaker, once, when I returned home from party, the daughter Shaheen turned her face from me. This incident totally changed my life. I quit drinking and wrote Daddy. It has been three decades since and I have not consumed alcohol,” said filmmaker Mahesh Bhatt while interacting with the audience.